Father Alexis Prem Kumar, who is from Tamil Nadu, was abducted from a school for refugee in Herat. Eight months after the Jesuit priest Father Alexis Prem Kumar was kidnapped in north-eastern Afghanistan’s Herat province, India on Sunday “secured” his release from the captivity of “terrorist elements”. At 4.12 pm, Prime Minister Narendra Modi posted on Twitter: “Delighted at securing the release of Indian Jesuit priest Father Alexis Prem Kumar from captivity in Afghanistan. The family told The Indian Express that the Prime Minister had informed them that Prem Kumar was alive, and had asked them to continue to pray for him. The Ministry of External Affairs has been in touch with the family ever since the priest was kidnapped last summer, and would normally tell them that India was working to secure his release. Delighted at securing the release of Indian Jesuit priest Father Alexis Prem Kumar from captivity in Afghanistan. But Sunday afternoon’s call was different — when Prem Kumar’s father Anthony picked up the phone, the Prime Minister himself was on the line. “My father cannot speak English. So my sister Elizabeth took the call. Mr Modi said that your brother is alive, safe, and is returning to India. Are you happy, he asked, to which my sister said yes,” John Joseph, the brother of Father Prem Kumar said, as he waited along with his father and sister at Chennai airport to board a flight to Delhi on Sunday evening. Have spoken to Father Alexis Prem Kumar. Informed happy family of Father Alexis Prem Kumar of his safe return after 8 months in captivity. Father Prem Kumar landed in Delhi about 7.30 pm. He thanked God and Prime Minister Modi. He said, “This is because of our Prime Minister. He saved me. He talked to me after I landed, and he arranged for my family to come here… I thank the people of Tamil Nadu and the Chief Minister of Tamil Nadu as well.” The priest belongs to Tamil Nadu. Sources in the Home Ministry said Father Prem Kumar would stay at The Ashok in Delhi for two days, and could meet the Prime Minister. 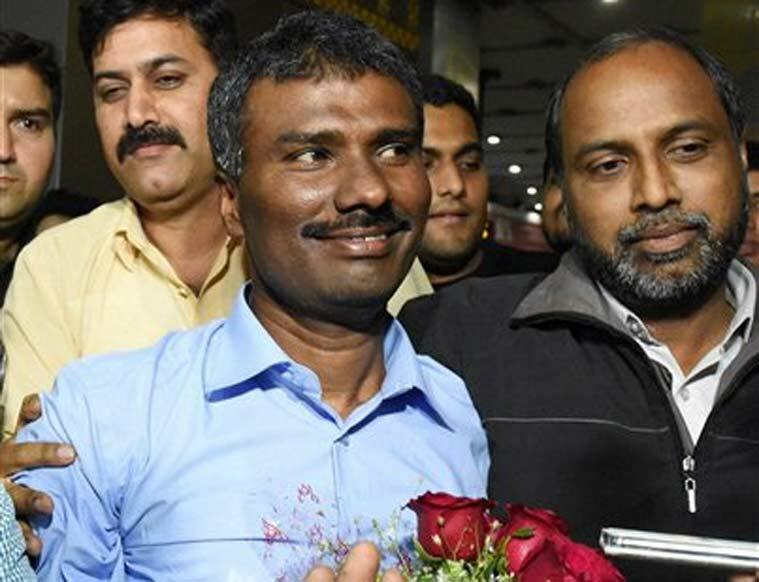 Father Prem Kumar is the fourth Indian to be released from captivity in the last 12 years in Afghanistan, the other three having been released in two separate incidents earlier. Two Indians were killed after being kidnapped in two incidents in 2005 and 2006. Sources said Prem Kumar, 47, was medically examined in Afghanistan after his release, and was put on the flight to India after his condition was found to be “satisfactory”. Officials declined to confirm whether a ransom was paid to secure the priest’s release. “If he had been kidnapped for ransom, it would have been resolved much earlier. In Afghanistan, there are multiple motives,” an official said. Another top official indicated that Prem Kumar might even have been released somewhere outside Afghanistan, and that the possibility of his having been released in Iran or Turkmenistan — both bordering Herat province — could not be ruled out. Sources said that while the trail had gone cold in November last year, it became active again in December and January. National Security Adviser Ajit K Doval visited Afghanistan on October 22, days after President Ashraf Ghani took office, and brought up the matter with him. He also met top security officials in Afghanistan to discuss the hunt for Prem Kumar. Subsequently, Modi spoke with Ghani during their meeting on the sidelines of the SAARC summit in Kathmandu, Nepal, in November last year. Sources said Indian intelligence agencies were in touch with the governments of Afghanistan and other countries on the matter. There is a strong possibility that help was taken from American or Iranian intelligence, they said. Prem Kumar was abducted from a school for refugees that he was visiting in the village of Sohadat, about 25 km from the provincial capital city of Herat. He was then working for the Jesuit Refugee Service, an international NGO involved in education in Afghanistan. In response of a question on his release, the official spokesperson of the Ministry of External Affairs, Syed Akbaruddin, said, “Father Alexis Prem Kumar Antonysamy, an Indian citizen who was kidnapped on June 2, 2014 from Herat province in western Afghanistan by terrorist elements, has been released. “The matter of his release has been pursued by our leadership, including at the highest level of the Prime Minister. We express our deep gratitude to all those who worked tirelessly over the last eight months to help in this humanitarian task of ensuring the safe release of one of our citizens. “Father Alexis Prem Kumar is now back in the safety of his homeland and arrangements are being made for him to rejoin his family soon,” Akbaruddin said.